My car threw P0202 Injector Circuit Open Cylinder 2 along with P0302 Misfire on cylinder 2. I also managed to get a whole bunch of freeze frame data but not sure that's relative but I'm guessing it shows what the engine was doing at time of codes stored? I would love some input here people. The codes point at what seems wrong. Thanks, I think it's a faulty injector on cylinder 2 or the wiring to that injector. I'm wondering if I should perhaps try to clean the injector first before buying a replacement. It is saying open circuit. Cleaning won't fix that. It is a wiring fault or an open in the injector coil. Ah, that's better a real answer to someone like me who knows little. Thank you. Auto Electrician - Feeding me BS? Help please! Ok, so I went to an auto electrician to get my codes read thoroughly. He finds a list of 8 or more old codes...I don't think he realised I knew they were old codes and that the car can store old ones. He then proceeds to tell me there are codes for this and that a CAN code, a boot code, a trans code, oooh he says this could be anything! He says it could be ECM. He then asks where the car was imported from - I said Japan, he asks am I sure it came from Japan as it could have been Singapore...huh? I was sure as it has a Japanese Nav unit. Anyway his point was to advise me some "European" cars have Biodegradable Wiring....yes wiring that degrades and appears is meant to or unknowingly now degrades? In this day and age? What? Anyway, he says this is what it could also be. Well I'll be...(I'm getting worried by this point) I know this car and all other XKR's were made in England NOT anywhere else. I'm sure the wiring loom is probably original not a 'biodegradable' replacement. In reality of course I don't know but based on the laws of probability I would think not. Besides, the car is a 2004 XKR Jag...wiring that self-degrades after 13 years in a Jag? Did anyone hear of that? Come on you're pulling my leg right? He then goes on to say "you'll need to bring it back so we can find the problem" and books me in for next Monday. I ask how much this will cost approx...he has "No Idea" - of course he says that. I'm pretty confused and bemused by now as he seems to have tried to pull the wool over quoting me all kinds of "possibilities". I told him the codes I found and I even brought a couple of very specific pages of the Jag Workshop Manual that show the diagnosis sequence to identify the issue whether it's injector or wiring according to the codes I found. He took that off me saying "it's good to have more info" and didn't bother even glancing at it. I doubt he even reads it! It clearly shows the methods to check with the correct ohm readings to look for etc. I just wanted this method done really, not bring it in and hope scenario. 50 bucks for a 5 minute code read. All for old codes. He did eventually clear them as I said "how about clearing them to see what still exists". One would assume he would get me to drive it then bring it back and for free rescan it. No suggestion of that...no suggestion of anything except bring it back for who knows how long. Before this post I contacted a Jag workshop in England,...(I'm in New Zealand) I gave them the codes (and freeze frame data) I found and he kindly replied to me and like the Jag Workshop Manual says it's either faulty injector or the wiring to that injector on number 2 cylinder. The kicker - Auto Electrician quotes after "30 years in the industry he has NEVER had a faulty injector"...really? I said. He was adamant. He seems to have never replaced one. It seems he doesn't really have much knowledge OR was trying to pull the wool over my eyes with 'gobbledegook' to give himself a nice easy money earner at my expense. Am I losing my mind and just being paranoid? I have lost any trust in this bloke. "Never attribute to malice that which is adequately explained by incompetence." or maybe "Don't assume bad intentions over neglect and misunderstanding"
I don't think he's incompetent, or that he doesn't understand his job, he runs the shop and it's busy. I think he knows exactly what he's doing. I have given him the following in a printout...hopefully he will follow it to the letter, if he can't or won't follow the tests I would have lots of other names for him rather than incompetent. One thing of note is when he had cleared the codes, I started the car to bring it home, my engine light was no longer on neither was restricted performance, I drove home fine albeit only a 5 minute drive. I know I need to drive a few miles on the car to probably have the code shown itself again. I am yet to do that still. necessary to check more than one injector or circuit, in which case, multiple DTCs will be set. Disconnect the relevant injector electrical connector. (PI07 to PI14). Measure the resistance between the injector pins. Is the resistance between 12 and 16 ohms? CLEAR the DTC. TEST the system for normal operation. Measure the resistance between the injector pin 01 and the injector body. Measure the resistance between the injector pin 02 and the injector body. Is either resistance less than 10,000 ohms? Reconnect the battery negative terminal. Disconnect the relevant injector harness electrical connector, (PI07 to PI14). Measure the voltage between the relevant injector harness electrical connector, (PI07 to PI14) pin 02 and GROUND. Is the voltage less than 10 Volts? circuit includes the EMS fuse box, fuse 18. For additional information, refer to the wiring diagrams. CLEAR the DTC. Disconnect the ECM electrical connector, EM80. Injector Cyl 1 pin 01 (BG) and ECM pin 120. Injector Cyl 2 pin 01 (BG) and ECM pin 115. Injector Cyl 3 pin 01 (BO) and ECM pin 114. Injector Cyl 4 pin 01 (BO) and ECM pin 119. Injector Cyl 5 pin 01 (BG) and ECM pin 113. Injector Cyl 6 pin 01 (BG) and ECM pin 118. Injector Cyl 7 pin 01 (BW) and ECM pin 117. Injector Cyl 8 pin 01 (BW) and ECM pin 112. Is the resistance greater than 5 ohms? Measure the voltage between the relevant injector harness electrical connector, (PI07 to PI14) pin 01 and GROUND. Is the voltage greater than 3 volts? Measure the resistance between the relevant injector harness electrical connector, (PI07 to PI14) pin 01 and GROUND. Contact Dealer technical support for advice on possible ECM failure. Update, auto electrician has had my car for 2 days now. Instead of injector or wiring to injector on number 2 cylinder I'm being told injector tested fine, however, I have worn out spark plugs. How can this explain it? I could have even found some others in my own country for $35ea same NGK model as recommended. I get a call today, got your plugs done...oh but we found another issue. An intake hose has perished and is full of holes...needs a replacement which will cost $200 and has to come from the USA taking 2 weeks. It's full of holes? No codes because of this???? Anyway, he says this is why it could also have been running lean....running lean? When did I say it was running lean or show a code of this nature? I never did. Has anyone heard of a perished intake hose being full of holes that caused no errors? Any in the know here that can come to a conclusion that my vehicle is running lean based on my freeze frame data in post 1 above? Up till the injector misfire code the other day the car ran like a rocket on demand...It drove perfectly. Go figure. Oh well, at least we won the Americas Cup today! indicate a transient lean condition on one bank. 1 Record flagged DTC (s) and accompanying WDS DTC Monitor freeze frame(s) data. 2 Fuel level > 25%. 3 Start the engine at a coolant temperature lower than the recorded freeze frame value (from Step 1). 4 Drive the vehicle to the recorded freeze frame conditions for 4 minutes. If CHECK ENGINE MIL flashes, lower the engine speed until the flashing stops. If, on the first trip, the misfire is severe enough to cause excess exhaust emission, the individual cylinder DTC plus DTC P1316 will be logged. The CHECK ENGINE MIL will not be activated. If the fault reoccurs on the second trip, the individual cylinder DTC plus DTC P1316 will be flagged, and the CHECK ENGINE MIL will be activated. If, on the first trip, the misfire is severe enough to cause catalyst damage (more severe than excess exhaust emission), the CHECK ENGINE MIL will flash while the fault is present and the individual cylinder DTC plus DTC P1313 (bank 1), DTC P1314 (bank 2) will be logged. When the fault is no longer present the MIL will be deactivated. 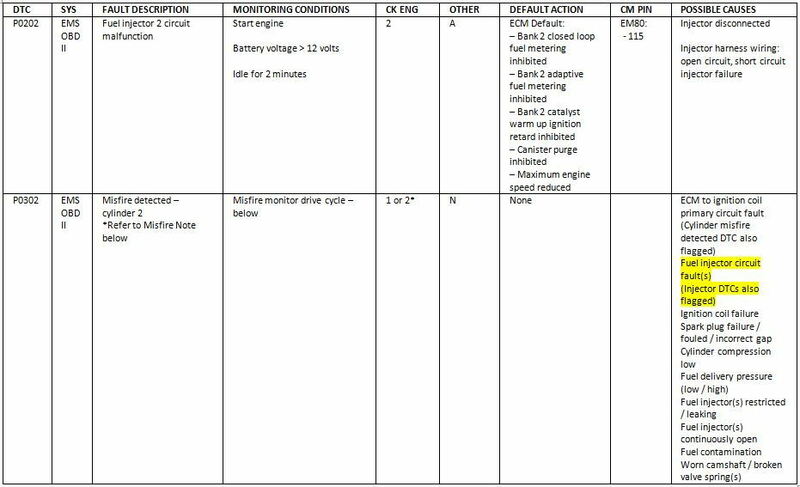 If the fault reoccurs on the second trip, the CHECK ENGINE MIL will flash while the fault is present and the individual cylinder DTC plus DTC P1313 (bank 1), DTC P1314 (bank 2) will be flagged. When the fault is no longer present the CHECK ENGINE MIL will be activated. The injector might check out, but that doesn't eliminate the harness. I am so glad I joined this fantastic forum! The information people are happy to give out is priceless I reckon. Thank you Mike for this detailed information. It has helped me make a bit more sense of it all for sure. Its repaired now, they diy'ed a hose repair as the part would have been a pain to source and if it functions as desired I'm fine with it. They reckon it would have been exhaust heat damage that more than likely caused the hose to perish. They said it will need some driving to let computer relearn. The bill wasn't as bad as I was thinking it was going to be either, 600 bucks NZ or 345 GBP at todays rate. I'm so relieved it was only plugs and a bad hose.